Christmas is almost upon those of us celebrating it this year. At this point, many of us have already bought our gifts. Some we’ve bought this year are very environmentally-friendly; others, decidedly less-so. For many of us, struggling through the post-recession haze, buying gifts this year has been a challenge; for others, we find ourselves worried about how much more waste or carbon we might be producing during the holiday season. And every year, we always forget to buy gifts for a few folks. Sudden realizations may lead to midnight rushes to dollar stores or box stores for a last-minute gift. Having remembered to get something for our loved one relieves our guilt, but having bought something environmentally-damaging might plague our conscience. A recent New York Times piece details a growing trend in gift-giving this year: bartering. To many, the idea of bartering may be unthinkable – the idea of buying something on-the-fly, and inexpensively, from a Wal-Mart or Target almost seems preferable to re-gifting something that might be used, or giving a skill instead of something material. 30 kg of CO2 for an mp3 player. 70 kg of CO2 or more for an electric kitchen appliance. 20 kg of CO2 or less for a board game. 5-10 kg of CO2 for a book. So, if a green product isn’t an option this year – either because it’s now too late, or because the recession has us all tightening our budgets – consider that sharing a skill or re-gifting with someone might be a good way to share this holiday. As the Times notes, the growing phenomenon of bartering – either skills or products – is closely related to the recession – and its practice has been growing in recent years. According to the National Association of Resale and Thrift Shops, net sales are up this year from 13% for last year; and according to scientific polls, 26% of Americans said they were bartering products and skills this holiday season, up more than double since 2000, when the question was first posited. But the practice of sharing a skill or re-gifting a product this year can have an environmental purpose, as well. It reduces demand for new production, lowering carbon emissions from the manufacturing process, and it keeps less-wanted gifts out of teetering landfills. (Consider how many of those last-minute, cheap gifts we received either broke quickly, or were generally unwanted, and wound up in the garbage bound for the landfill. The thought is certainly sobering.) So this year, instead of rushing out last-minute for a gift that’s probably going to the landfill, considering a barter of skills, or a re-gifting from last year. Your wallet, the earth, and perhaps most importantly, your friends and family, will thank you. For items like green products, green books, and green insulation, you can always visit http://www.greendepot.com. 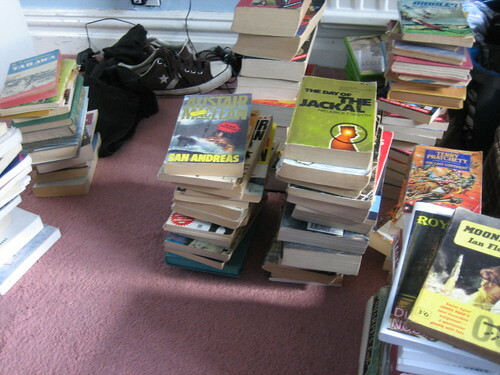 image of books by flickr user nedrichards; image of landfill by flickr user d’arcy norman. The Lowdown on Eco-Labels: What Do They Really Mean? As we try to travel in greener directions through the wild, wild west of the consumer market, there are plenty of markers along the way to guide us–in the form of eco-labels, those little green symbols printed and/or stuck on nearly everything you can buy these days. There are symbols indicating that a product is organic, chlorine-free or grown upside down without soil; that it was made by people paid a fair wage or by chickens allowed to go for walks in the sun. If there’s an environmental issue worth considering, there’s an eco-label related to it—which on one hand is fantastic, but on the other… Well, it gets to be a bit much. After a while, all the symbols seem to fade into a solicitous green haze with about as much meaning as the words “As seen on TV!” on the box of the latest trendy gadget. And what’s worse, some of the labels don’t even mean what they appear to. Who would guess that their “free range” chicken might have never even seen the open sky? And others don’t mean very much at all, like organic labels on fruits and vegetables that aren’t normally grown with pesticides to begin with. But we’re not likely to see any fewer eco-labels anytime soon–we’ll probably only see more, and some of them are genuinely useful indicators of qualities you might actually care about. So with that in mind, here’s a brief run-down of a few of the most commonly seen eco-labels and what they mean, then a list of places where you can learn more about these online and look up the rest of them, too. EnergyStar is probably the most often-seen eco-label. EnergyStar is a joint program of the EPA (U.S. Environmental Protection Agency) and the U.S. Department of Energy, and it awards the EnergyStar label to household products, homes and nonresidential buildings that meet its energy efficiency requirements. Its standards are lower than those required for LEED certification, but it’s a decent start. LEED (Leadership in Energy and Environmental Design) is a program run by the U.S. Green Building Council, a nonprofit organization with no government affiliation. LEED provides third-party verification that a building project followed green building procedures, meets energy efficient performance standards, and is a health place to live or work. The main criteria for evaluation are sustainable site development, water savings, energy efficiency, the use of sustainable materials (e.g. low-VOC paint, green insulation) , and a healthy indoor environment. The program is based on a system that awards a silver, gold, or platinum certification level, based on the number of points a project was able to win by addressing the various criteria. Certification is entirely voluntary. USDA Organic This label indicates that the product meets the National Organic Program of the U.S. Department of Agriculture’s standards for using the word “organic” in its labeling. These standards vary for the different products that are eligible for the label, which include not only food but personal care products as well. But most require the absence of synthetic fertilizers, conventional pesticides, antibiotics, growth hormones and sewage sludge in the production process. You can find a table outlining the different requirements for different products here. Fair Trade This symbol indicates that the product has been certified by TransFair USA, which is the only U.S. member of FLO (Fairtrade Labeling Organizations International, the Germany-based umbrella organization for a group of 20 international fair trade certifying nonprofits). Fair Trade Certification standards help farmers and farm workers to lift themselves out of poverty by investing in their farms and communities, protecting the environment, and helping them developing the business skills necessary to compete in the global marketplace. The label signifies that the product was grown by small-scale farmers who are democratically organized, either in a co-ops or unions; that the buyer paid up to 60% of the cost of the raw materials in advance, that a fair wage was paid and no child labor was used in production, that none of the 10 worst pesticides were used in the growing process, and that the buyer paid additional premiums to go toward services to support and develop the farm community. FSC The FSC label indicates, essentially, that a wood product was grown in a forest that is being managed responsibly and sustainably. The FSC (Forest Stewardship Council), certifies forest managers and manufacturers of wood products that it determines are managing forests and using forest products responsibly and sustainably. Among their major concerns are not allowing logging practices to destroy forests, protecting the habitats of endangered wildlife, and making sure the profits from commercial forest endeavors are shared fairly with communities living in the forests. The FSC is not affiliated with any government, is a nonprofit organization, and certification is entirely voluntary.